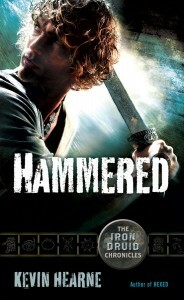 This New Writer Spotlight features The Iron Druid Chronicles author Kevin Hearn. 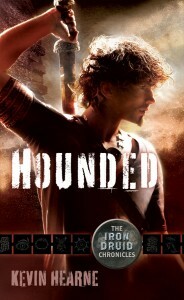 He enters the publishing world with his first novel Hounded, which releases on May 3, 2011. You can find Kevin online at his author website, on Twitter, and on Facebook. Kevin Hearne is a native of Arizona and really appreciates whoever invented air-conditioning. He graduated from Northern Arizona University in Flagstaff and now teaches high school English. When he’s not grading essays or writing novels, he tends to his basil plants and paints landscapes with his daughter. He has been known to obsess over fonts, frolic unreservedly with dogs, and stop whatever he’s doing in the rare event of rain to commune with the precipitation. He enjoys hiking, the guilty pleasure of comic books, and living with his wife and daughter in a wee, snug cottage. What is your first published novel? What’s it about? HOUNDED is my debut, featuring a 2,100 year-old Druid living among us who’s been on the run from Irish gods for much of that time. The novel picks up where he basically decides to stop running and fight. All pantheons are alive and well and trying to make their way in this secular, scientific age—and most of the monsters and boogeymen are too. I had lots of fun with mythology, taking it back to its roots and stripping away the sugary layers that Disney has painted on top of it. What were some of your biggest challenges with Hounded during the writing process? Irish words are tough both to spell and pronounce and can cause severe issues with one’s self esteem. Sifting through loads of myth and deciding what to keep and what to throw away was almost a labor of Hercules, but I’m well. Do you have a favorite scene or character that you most enjoyed writing? I loved Oberon, the talking Irish wolfhound—still do. He’s such a fun fella, and most of my early reviewers indicate that he’s their favorite character to read. Hounded is my first published work, but it’s going to be followed up very quickly by Hexed on June 7 and Hammered on July 5. Right now I’m working on book four of The Iron Druid Chronicles, called Tricked. How would you describe the type of fiction that you write? What is it about this type of fiction that you enjoy so much? I write urban fantasy, but I’d like to stress that very few of my characters wear leather pants. I enjoy the genre because the possibilities are so enormous—take any mythology or critter from folklore and drop it into the modern world, then watch everything go crazy from there. Do you have a mentor or another writer who helped to guide you through your writing process or with developing your career? Who do you turn to for advice? Nicole Peeler and Kelly Meding have been fabulous to me ever since I signed my deal. Once I joined The League of Reluctant Adults, I had an even larger group of authors to turn to when I had a question or just needed therapy. I’ve been very fortunate. It is said that learning to write well is like experiencing a series of never ending writing related epiphanies. If you had to pick one, what is the most important lesson you have learned, so far? Don’t give up. It took me 20 years of trying, but I’m finally getting published. When did you first know that you wanted to write? What inspired you to tell stories? I first figured it out at age 19. I read One Flew Over the Cuckoo’s Nest and was so inspired by that voice, and by the message that we need to hang onto our sense of self in a society that would have us conform. Which authors, stories, or novels most affected your development as a writer? Besides Ken Kesey, I’d say Neil Gaiman, Neal Stephenson, and William Gibson. All of them are great stylists and tell brilliant stories. What kind of writing related education have you received? How do you think it has helped or prepared you for your own writing? My education trained me to be an English teacher, so it prepared me more for essay writing than for fiction. The most valuable education you can receive in writing is to read a lot. The more books you read, the more plots and words you’re putting into your noggin so that you can rearrange them all in fabulous new ways. So every author I’ve ever read helped me become the author I am today. the book releases on May 3rd. 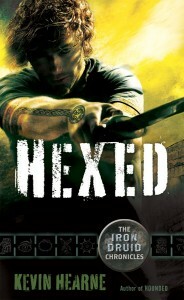 This entry was posted in Books and Literature, Fantasy, Fiction, Interviews, Uncategorized, Young Adult Literature and tagged Hammered, Hexed, Hounded, Kevin Hearn. Bookmark the permalink. OH that was a great interview. I cannot wait to read this series. It sounds fantastic and I love the premise of it. Plus the covers totally rock.